Here is this year’s spring bag – made with one charm pack and one yard of fabric! This is a really cute pattern called the Borsa Bag. You have to sew the squares together in a specific grid pattern, and then you start sewing the seams to turn it into a 3 dimensional bag. You really had to put your thinking cap on to get it put together correctly – I had to wait until my son went to bed so I could totally concentrate on it. The pattern is cool, because you can use any size squares – 5″ charm squares make a nice sized handbag, while 8″ squares would make a nice roomy tote. I used the left over charm squares to make a little zip topped bag, it still needs some tweaking. However, once I get it just right I will write up as a pattern and post it for you :). 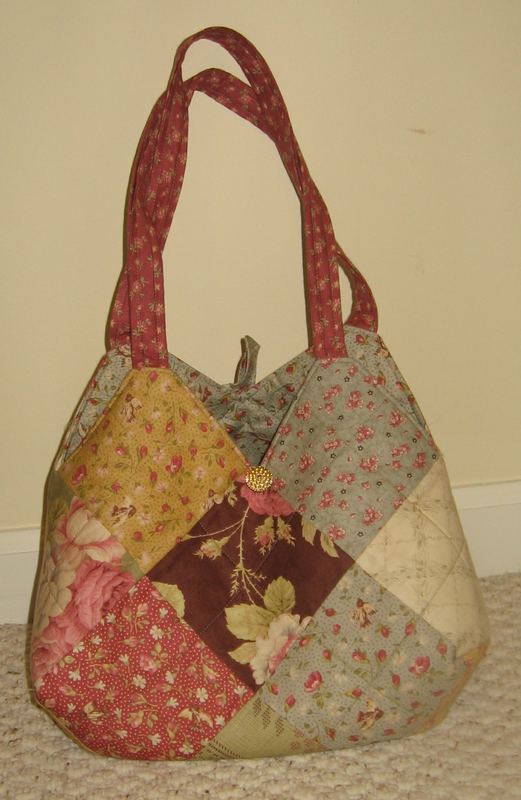 Sarah, the pattern for the bag is called “La Borsa Bag” and is by Meredith Burns. I don’t think the pattern is for sale anymore. I didn’t end up doing a tutorial for the bag or for the zippered pouch.